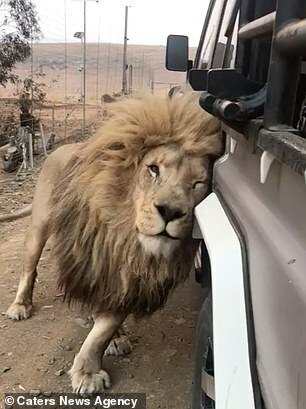 This is the adorable moment a confused lion mistakes big cars for members of his pride as he cleans, prunes and protects them. 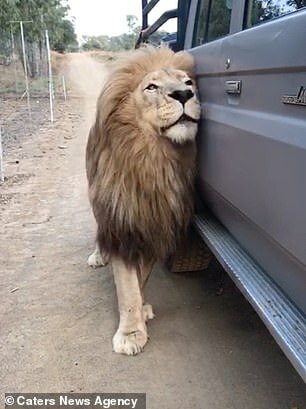 Shane the 15-year-old African lion shows his affection to larger cars in a similar way to how lions treat each other. He is seen grooming, rubbing and licking them as though they are animals of the same size. The conservation director at GG Conservation, Suzanne Scott, 50, said it was surprising to see the unusual behaviour but it makes her feel like ‘part of his pride’. Shane, from Harrismith, South Africa, cosies up to big cars as they drive through the reserve he lives on. He looks completely relaxed as he rubs his face and mane against the cars while they stay still. At one point he hooks his tail over the wing mirror and brushes up against the window. African lions are considered the most social of all the big cats and usually live in prides containing 10-15 others. Lions are the only big cats which live in a group, which is like a family unit – made up of roughly three males, six females and some cubs.